Use a handicap shower chair for independent showering. Shower chairs assists and provides, anyone with coordination or balance difficulties, handicaps or disabilities, a safe and comfortable environment for showering. When we get older and the years add on, our coordination and balance may suffer. Additionally, disabilities or other handicaps can affect the strength in our legs. This can influence the ability to stand for long and even short periods. Activities like taking a shower, once taken for granted, are now difficult, dangerous and painful. Due to these problems, it is a good idea to invest in one of the many varieties of handicap shower chairs. Handicap shower chairs are special chairs meant to sit in ones’ shower and provide a way for someone, who cannot stand in the shower anymore, to still get bathed properly without having to stand. You use a handicap shower chair by sitting in the chair and showering as you normally would. There are other sitting devices known by other names like the handicapped shower seats and the handicap shower bench. They are used in similar fashions but some are longer in size and can be folded away with ease. Shower chairs offer a number of benefits to people who have disabilities or who are not able to stand in the shower anymore. Some features that these chairs have is a hole in the center that can act as a toilet similar to a commode. A removable bucket underneath collects everything for simply disposal. You can have a place to sit in a shower with minimal or no installation. Another bonus of a shower chair is the ability to sit down and scrub the soles of your feet. Some people attempt to stand on one leg when cleaning the feet and this can create a hazardous scenario. Having soap, a slippery shower surface and the scrubbing movements, together in a shower, can lead to nothing good. 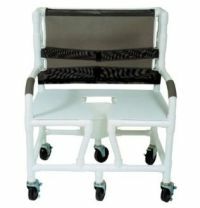 On a shower chair, the individual can stabilize themselves easily and remove any dangerous situations. There are also extended shower chairs that go pass the shower curtains and provide amply seating area for larger individuals. They can also be great for shower chair transfers. Adding a handicap shower chair is a great way to retain the ability to shower freely and privately while keeping you safe in the process. 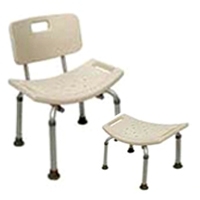 Bariatric shower chairs are equipped with reinforcement frames and sturdy bolts on the seats for extra support. adjustable cushions. Most rolling or wheeled bariatric chairs have footrests and slip resistant handrails on the sides that can assist entry and exit. The seat widths are about 25 inches to 30 inches. They are generally made out of very durable stainless steel that can hold up to 700 to 1000 pounds. They have rounded edges and some come with special grab bars you can grab on to for extra support if you need it. A handicap shower chair can provide you with the same sense of freedom you are used to having and allow you to still enjoy your shower without the assistance of others. For a smaller chair option, there are handicap shower stools that can fit most any tubs. Handicap shower chairs vary in price depending upon where you purchase them and if they have the extra accessories. You can get a nice quality handicap shower chair for around $300 but the bariatric or heavy duty chairs will cost at least $700 to $1300. Some insurance companies may provide reimbursement for all of the cost of the handicap shower chair or a partial amount. You should contact your insurance company ahead of time to ask about what part they may cover if they do at all. If you have to purchase one on your own be sure to keep the receipt.